Treat Williams guest stars as “Lenny” in the new episode of Blue Bloods airing tonight (March 15) on CBS. Frank’s longtime friend Lenny (Treat Williams) reveals to him that an upcoming exposé will air some of the NYPD’s dirty laundry. Also, Erin must decide how to charge a doctor whose experimental treatments led to the death of his terminally ill daughter; Danny and Baez investigate the mysterious overdose of a promising artist; and Jamie follows a lead about a corrupt officer in his precinct, on BLUE BLOODS, Friday, March 15 (10:00-11:00 PM, ET/PT) on the CBS Television Network. Some photos can be found below. "Two-Faced" -- Frank's longtime friend Lenny (Treat Williams) reveals to him that an upcoming exposÃÂ© will air some of the NYPD's dirty laundry. Also, Erin must decide how to charge a doctor whose experimental treatments led to the death of his terminally ill daughter; Danny and Baez investigate the mysterious overdose of a promising artist; and Jamie follows a lead about a corrupt officer in his precinct, on BLUE BLOODS, Friday, March 15 (10:00-11:00 PM, ET/PT) on the CBS Television Network. 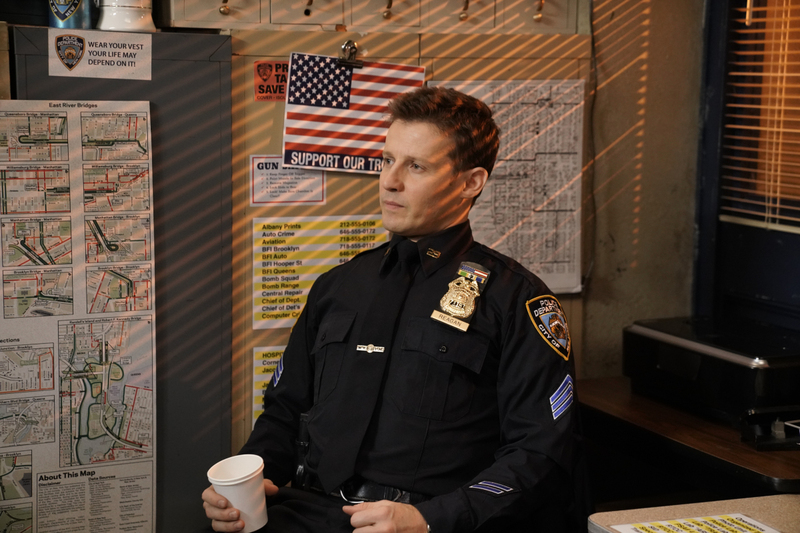 Pictured: Will Estes Photo: Patrick Harbron/CBS ÃÂ©2018CBS Broadcasting Inc. All Rights Reserved. Blue Bloods stars Tom Selleck (Frank Reagan), Donnie Wahlberg (Danny Reagan), Bridget Moynahan (Erin Reagan), Will Estes (Jamie Reagan), Len Cariou (Henry Reagan), Marisa Ramirez (Det. Maria Baez), Sami Gayle (Nicky Reagan-Boyle), and Vanessa Ray (Officer Eddie Janko). Recurring cast in the episode includes Andrew Terraciano (Sean Reagan), Abigail Hawk (Abigail Baker), Gregory Jbara (Garrett Moore), Robert Clohessy (Lt. Gormley), Steven Schirripa (Anthony Abetamarco), James Nuciforo (Nuciforo), and Yasha Jackson (Maya Thomas). Guest stars in “Two-Faced” include Treat Williams (Lenny Ross), James Riordan (Chris Johnson), Armand Schultz (Dr. David Peterson), Mike Keller (Lt. McDonnell), Jennifer Roszell (Elaine Peterson), Leigh Ann Larkin (ME Megan Carson), David Levi (Gavin Schlenger), Fortuna Gebresellassie (Annie DA’s Office Assistant), Ron Simons (Dr. Diubaldo), Erika Rolfsrud (Kathy Zora), Francesca Mckenzie (Caroline Mason), Edward Hibbert (Milton Vance), Moise Morancy (Twitter Ty), Donald Dash (Will Thomas), Leila Almas (Vance’s Assistant), Karl Kenzler (Jeremy Breen), and Derek Hedlund (Uniform). Did not really appreciate the way officer Thomas was portrayed in this episode.